Ray Morris started building Micromodels when he was about 10 years old. In 1998, when he was 51, he took a job as a graphics technician in his local school. Here he looked after a lot of computers and was able to scan the two original Micromodels which he had kept for years in his treasure box. Because he thought he would never see a Micromodel again he started designing models himself. 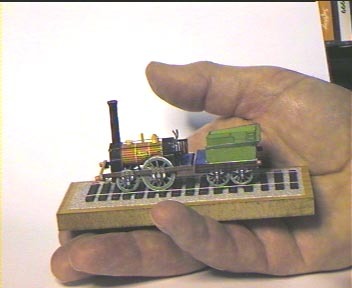 Over the years Ray made some very nice model locomotive designs in the style of Micromodels. These models are available on some CD-ROMs. Some of the models can be downloaded for free at his site. And a few models can be bought as printed kits. These models may be slightly larger than Micromodels, scale 1 : 175 , but you can simply print them in a desired scale. Ray Morris has designed the railway models of MicromodelsUSA : set F III CP Huntington and Burlington Zephyr and set PG 9 Famous Movie Train Oulton Hall.